A postseason preview may have very well taken place Thursday, with the Greenwich and Staples High School girls tennis teams facing each other in a match that certainly didn't resemble an early season affair. The duel between the two rivals, which will most likely be among the contenders for the FCIAC championship, had the look and feel of an intense postseason tournament match -- and to no one's surprise it went right down to the wire. 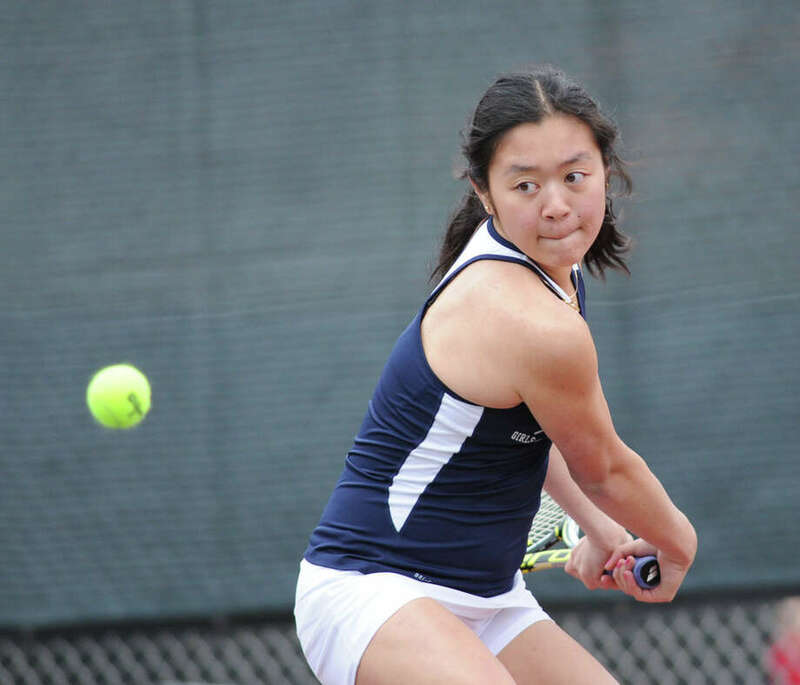 Receiving victories from second and fourth singles players and second and third doubles teams, Staples edged host Greenwich, 4-3, in a match featuring long rallies and impressive shot making. "It's a good win for us early in the season," Wreckers coach Paco Fabian said. "Playing a good team like Greenwich, which has a winning tradition, is great for our team." Greenwich (0-1), which started three freshmen, received wins from singles players Maddie Arnold (No. 1 spot), Anna Daccache (No. 3) and its No. 1 doubles team of Riley Sheets and Lena Schipper. "This is a young team with a lot of potential," said Cardinals coach Betsy Underhill, whose team advanced to the FCIAC Tournament finals last season. "I see this team getting better and better as a whole as the season goes on." All eyes were on Staples sophomore Megan Brown and Greenwich junior Maitlyn Murphy as they competed in the deciding match at fourth singles. In a grueling three-setter that lasted approximately two-and-a-half hours, Brown posted a 6-2, 3-6, 7-6 (1) victory, giving the Wreckers a 4-3 triumph. Murphy led 4-3 in the third set, but Brown broke serve, then held to go ahead 5-4. Both players held serve the next two games, forcing a tiebreaker. Brown jumped out to a 4-0 lead in the tiebreaker before closing out the match. "I was not aware of the score," Brown said. "I was just trying to win the match. She had a great game and in the tiebreak I just tried to not let the pressure get to me. This was a really tough match." Said Fabian: "It was good for both girls on the court to play in a match like that. They both played well." Underhill liked what she saw from Murphy, who successfully retrieved a number of Brown's forehands throughout the match. "Maitlyn is in that position because of her great tenacity," Underhill said. "She did not give up and she went after everything." Arnold, a sophomore, defeated Wreckers sophomore Vanessa Mauricio, 6-4, 6-4 at No. 1 singles. "The second set tested my head a little bit, because I won pretty quickly in the first set," Arnold said. "It was a good test for me and it helped prepare me for the rest of the season. We have a lot of freshmen on our team, which is good. We have no where to go but up from here and we will get better." Staples senior Alex Collins registered a hard-fought 6-3, 6-4 win over junior Maggie Glynn at second singles. At third singles, Daccache was a 6-2, 6-2 winner against senior Gabi Titelbaum. "It's good to start off the season against a team that's an FCIAC contender," Daccache said. "Even the matches we lost today will help us get better. There were some young nerves with some of our starters, but the fact that the matches were all so close shows the potential we have." The freshman duo of Kristen Butler and senior Xenia Bradley recorded a 6-2, 6-3 win against Greenwich's Camilla Akerman/Sakura Yurugi at No. 2 doubles. Junior Olivia Daytz and freshman Olivia Foster were victorious at No. 3 for Staples, beating the Cardinals' freshman duo of Hannah Crasto/Melanie Murphy. "We work on our doubles a lot and that helped us today," Fabian said. "One of our strengths is depth, so winning at two and three doubles was important for us today." Sheets and Schipper, both seniors, displayed solid chemistry in their tough 7-6 (3), 6-1 win against senior Avery Wallace and sophomore Tess Rubin. "Last year, we lost to this same exact team, so it feels good to beat them this year," Sheets said. "It wasn't the prettiest match, but it definitely feels good. Said Schipper: "After we won the tiebreaker we were able to power through and keep up the consistency. Overall, our team has a good dynamic and I think we can achieve a lot." Singles: Maddie Arnold (G) def. Vanessa Mauricio 6-4, 6-4; Alex Collins (S) def. Maggie Glynn 6-3, 6-4; Anna Daccache (G) def. Gabi Titlebaum 6-2, 6-2; Megan Brown (S) def. Maitlyn Murphy 6-2, 3-6, 7-6 (1); Doubles: Riley Sheets/Lena Schipper (G) def. Avery Wallace/Tess Rubin 7-6 (3), 6-1; Kristen Butler/Xenia Bradley (S) def. Camilla Akerman/Sakura Yurugi 6-2, 6-3; Olivia Daytz/Olivia Foster (S) def. Hannah Crasto/Melanie Murphy 6-4, 6-1.